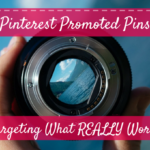 If you’re interested in tracking conversions and sales from Pinterest Promoted Pins, go here. 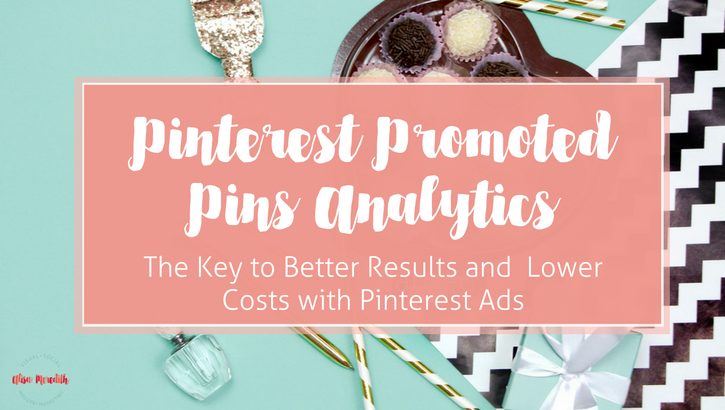 Today what we’re talking about is Pinterest’s own Ad Dashboard – where you’ll find gems and hidden bits of data that will help you make your Pinterest advertising more effective and less expensive. So let’s start from the top! 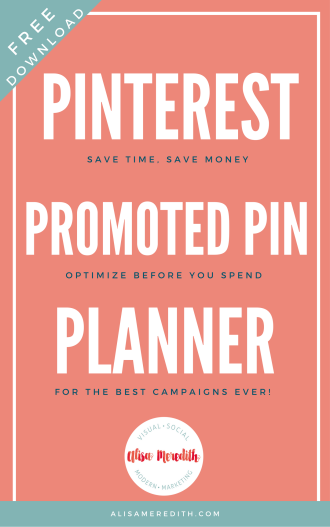 Before we do, you should know that Pinterest saves data on your Promoted Pin campaigns for 30 days after they end. While some data (such as continuing earned clicks and saves) continues to record, you will not be able to see everything you might want, so make sure you’re at least saving printscreens of your Promoted Pins dashboards as they’re ending. You should also know that it can take a couple of weeks to get your Promoted Pin in all the spots you targeted. 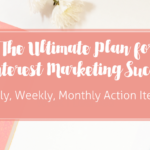 Whether this is a case of Pinterest working it in to limited ad space based on demand, or the algorithm causing a delay when interest targeting is used is up for debate, but at any rate, give your campaigns a few weeks before you make start making changes. 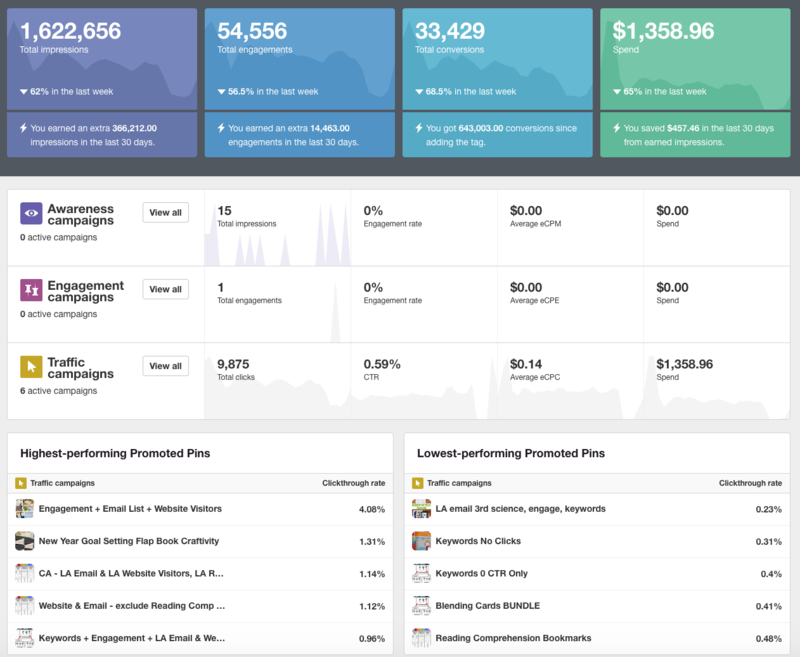 The Promoted Pins Dashboard and its analytics are fairly self explanatory. Poke around a bit and you’ll get a feel for it. Many things which might otherwise be puzzling (CPC v. eCPC, for instance) are easily clarified by hovering over the text to reveal hints and definitions. 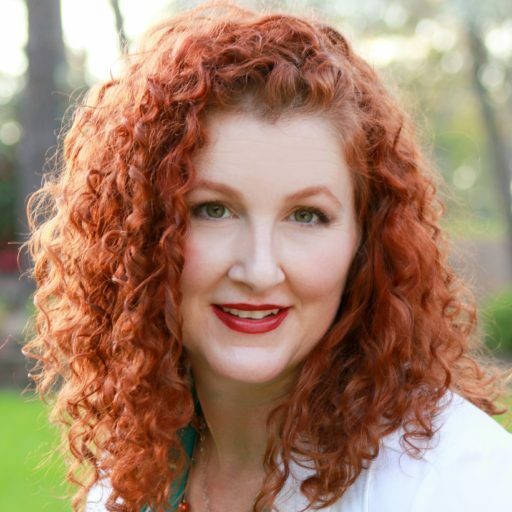 Still, there are a few things you have to dig for, and a couple more things that are completely counterintuitive, so I thought I’d go over what I look at in analytics and where they can help you improve your results or decrease costs. 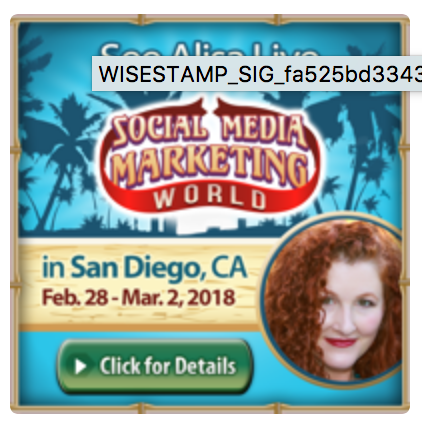 I only ever use and recommend Traffic campaigns for Promoted Pins (they’re the only economical choice), so that’s what we’re going to look at here. In the bottom colored boxes next to the little lightning bolt icons, you see the “bonus” activity you’re getting from downstream activity – activity resulting from other people saving (repinning) your promoted pin. Highest and Lowest-Performing Promoted Pins. This account is going great – Pinterest suggests you aim for 2-3% clickthrough rates on Traffic Campaigns. Save Money or Improve Results Here: If I saw some real underperformers, I would click through from here to edit or pause the pin, but everything looks good! If I wanted to take advantage of a top performer, I might click through to that pin and up my bid and/or my daily budget. Instead, I’m going to dig in to my campaigns by clicking on the “view all” button in the Traffic Campaigns box. Clicking on the Activity tab gives you a clear idea of the paid v. earned activity. 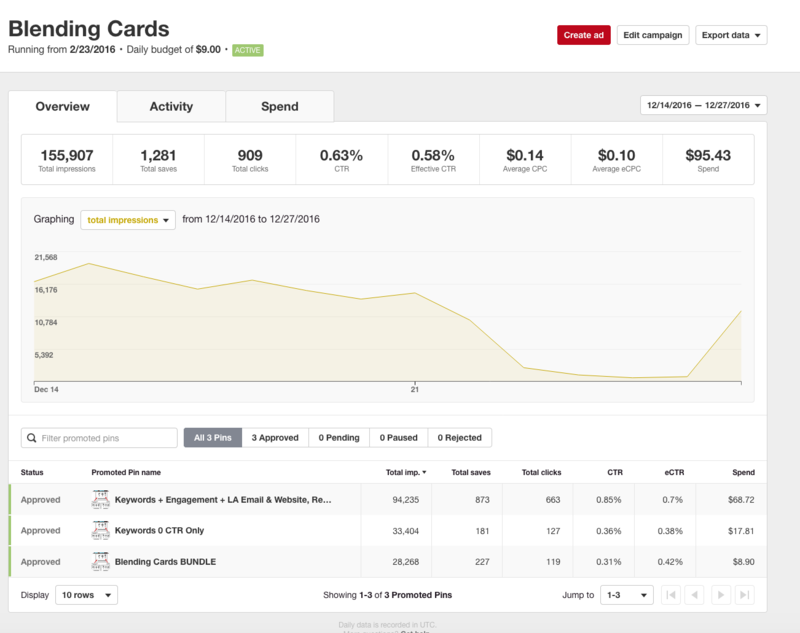 Clicking on Spend will show you more about what you’re spending and what budget you set up. Ignore conversions. If you want conversion information, it’s better to rely on Google Analytics Goals and URL tracking (here’s how to do it). 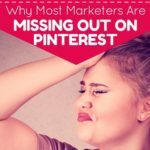 Pinterest conversions are not reliable. I’ve seen “conversions” on promoted pins with zero clicks. That’s impossible! Now we’ll take a look at one campaign. Notice that the data points are all the same as it was at the all-campaign level, but now we can see the individual Promoted Pins underneath the graph as well. Save Money or Improve Results Here: Here’s a good place to look at how each individual campaign is doing. Is one CTR exceptionally high? Maybe you want to increase the bid to give it more impressions. Is one campaign generating a lot of saves, but not many clicks? If you’re OK with that, fine, but if not, might you want to edit the description on the pins in that campaign to encourage clicks or even make a new image and promote a new pin that might be more motivating? This is where it starts to get really good. 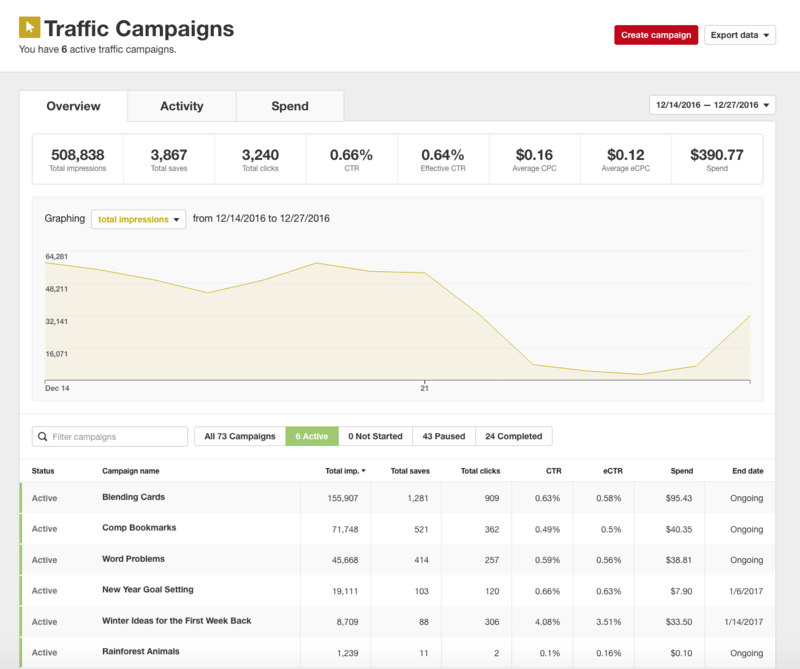 You’ll be able to see how your targeting is impacting your results. Underneath the graph, you’ll see your targeting options. This is where analytics is extremely revealing! 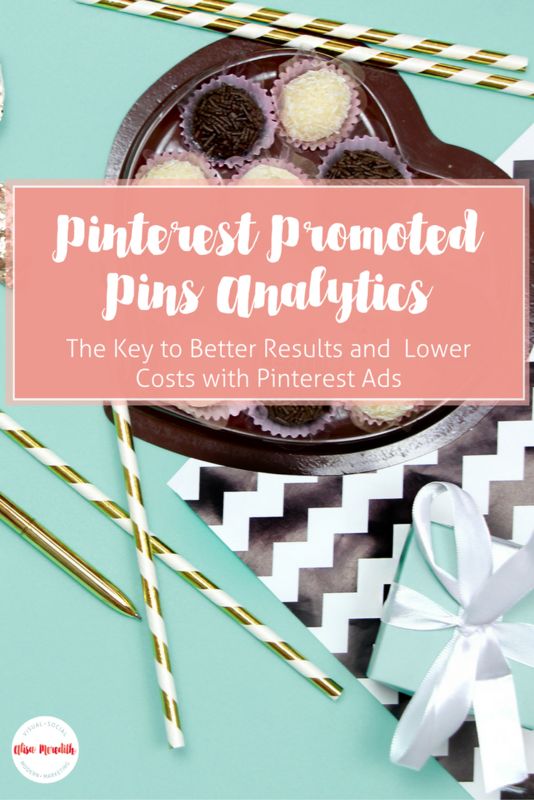 Save Money or Improve Results Here: If I noticed a Promoted Pin was not getting enough impressions or clicks to meet my daily budget (or otherwise be worth my time), I would increase the maximum bid on that pin by a small amount or pause it altogether. I want to edge it up until it hits a sweet spot of bargain and impressions. Because this is a bidding situation, you could just up your bid to the max you are willing to pay, but I’m still looking for the deals! Where I might decide to leave it alone is if I’m getting a lot of saves (repins) but not a lot of clicks. That’s because repins are going to result in free clicks down the line, so I’m happy to get the free exposure and rely on volume of pins to eventually bring in the traffic I really want. Using interest targeting can improve conversions, but it can also be very pricey, depending on the interests you choose. For that reason, do keep a close eye on your pins that employ interest targeting! Save Money or Improve Results Here: In some cases, I have seen clicks for one interest cost four times that of another. In that case you might edit the promoted pin and remove the expensive interest if it wasn’t worth that much to you in comparison to the bargain interests. 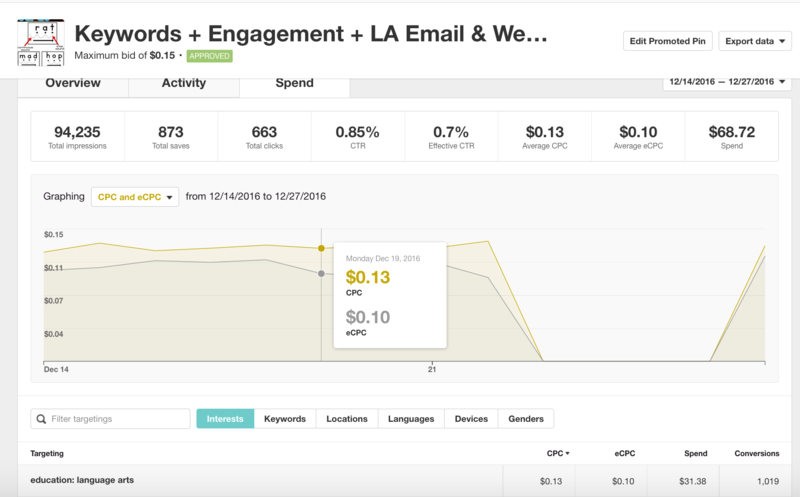 See what each keyword is costing you and how well it’s converting from impressions to clicks or saves. Again, this can vary widely (although here, with a max bid of $.15 we won’t see much variation). Save Money or Improve Results Here: Consider removing keywords that are costing too much, or separate them out into their own separate promoted pin if it’s worth it to you but you want more control over where the money goes. Seeing where your targeted and engaged pinners are is interesting for all accounts, but especially if you are targeting specific locations and/or are a local business. Here is where a working “conversions” column would be very helpful (buyers from Atlanta convert to sales at a 3x higher rate than those from NYC? Cool! ), but I’m sure they’ll get there. Save Money or Improve Results Here: Are clicks from pinners from Toronto three times more money than those of pinners from Alberta? If pinners from Toronto aren’t three times more valuable to you, shut them off! See the languages of the people engaging with your Promoted pin in the tab. 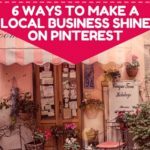 Most of the time you’ll specify that you want only your own language, but Pinterest can’t always tell a Pinner’s language, so you might choose to target all. Save Money or Improve Results Here: Look to see how people of other languages are engaging with your pin. It could be these folks are multilingual and are really enjoying your content. On the other hand, if you notice all your budget is going to folks who speak Turkish and that’s not working for you, add in some targeting for the languages you DO want to reach! A peek at device activity from the Spend screen is always interesting. What you pay per click and the amount of activity on each can vary to an amazing degree! Here where the max bid is only $.20 there isn’t a lot of room for variation, but you can still see the difference. Save Money or Improve Results Here: If you know that people on mobile web don’t convert well for you, you might just decide to shut off that option. If android tablet clicks are 10 times that of iPad, shut them off – as long as android tablet users aren’t converting exceptionally well. See who is engaging with your pin. You might be surprised! Many people target only women or only men, but I often find that “unspecified” pinners make up a pretty good percentage of engagers. Save Money or Improve Results Here: If you’re seeing, for instance, that clicks from female pinners are generating a lot of earned clicks for you, whereas the fellas aren’t, you might then decide to cut off the guys. Sorry, guys. Then again, men are more likely to purchase from Pinterest than women, so it’s your call! Wait! Where Is the Data for My Audience Targeting? If you’re targeting an audience of your website visitors, people who engaged with a pin to your site, a list of email addresses you uploaded, an actalike audience, or any combination thereof, you’re not going to see how well that is working in Promoted Pin analytics. What!??! I know. People on my email list OR those who fit the criteria of the keywords, interests, and location I specified. 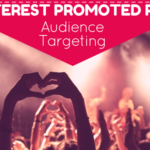 Because Pinterest doesn’t show us the audience size when we add in other targeting, it’s not immediately apparent that this is the case. When you target multiple audiences, however, or you run one campaign to target one audience and another to target a different one, you need to see how the audiences are performing. Luckily, you can get to that information when you export your data. Let’s cover the basics of what your export options are and then get to how to decipher audience performance. Current View: All activity on all pins in this campaign, broken down by set targeting as well as locations (whether you targeted specific ones or not). This is where you get your audience data as well.If you have conversion event tracking enabled and configured, you’ll see all the different types of conversions here. If you don’t, I wouldn’t trust those numbers even if you see them! You’d think “current view” might be different depending on which tab you’re on (overview, activity, spend), but it’s not! It’s pretty interesting, as it shows you (at campaign level only, not for individual pins – good reason to have one pin per campaign if you can) all the keywords people are using when they see your pin.I was shocked to see that for one of mine, the top keyword was “lularoe.” What??! Well, one of the pins in that campaign used audience targeting without keywords, so apparently my audience is big into Lularoe – which I had to Google. Again, I wished I’d only put keyword-targeted pins in that campaign so this export would make more sense. All Data: Same as above. 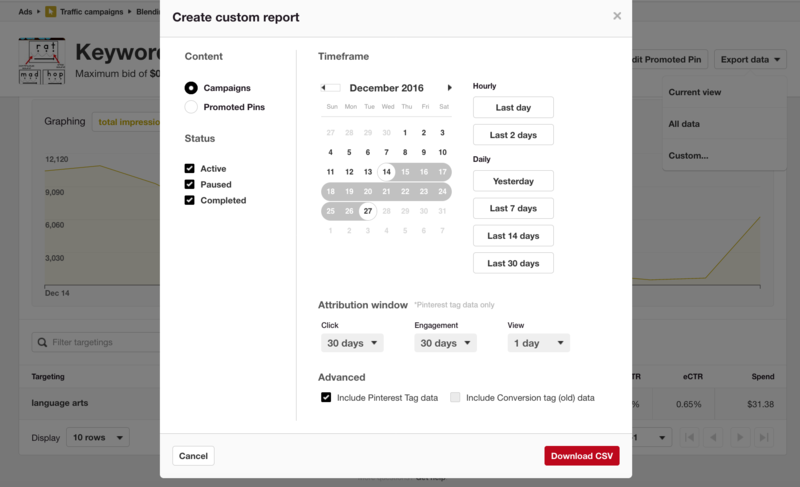 Custom: This is a bit odd, because choosing “campaign” or “pins” here will export ALL the data for ALL your campaigns or ALL of your pins even though you have drilled down to one campaign and you’d think it would be limited to that campaign. Yikes! Once you’re in the individual Promoted Pin you get the same as above, but for “current view” and “all data” the export will be limited to the individual Promoted Pin. If you’re a spreadsheet nerd (I might be, just a little bit) this might be a better way for you to look at your data, and with keyword query data and audience performance only available with exports, it’s definitely worth a look for a lot of us. 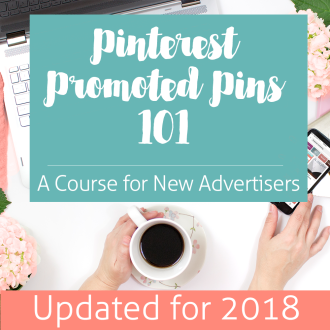 Grab the info for the whole campaign with multiple pins if you ran similar ads and just used different audiences for the different pins. Grab it at the individual pin level if you used multiple audiences in the same Promoted Pin. For the Current View and All Data exports, the audiences are at the top. I’ll export these and then add a couple of columns (in orange) to figure out and compare the clickthrough rate and cost per click for each audience. Again, which such a low max click bid, we’re not going to see a huge disparity, but in your account, you might! 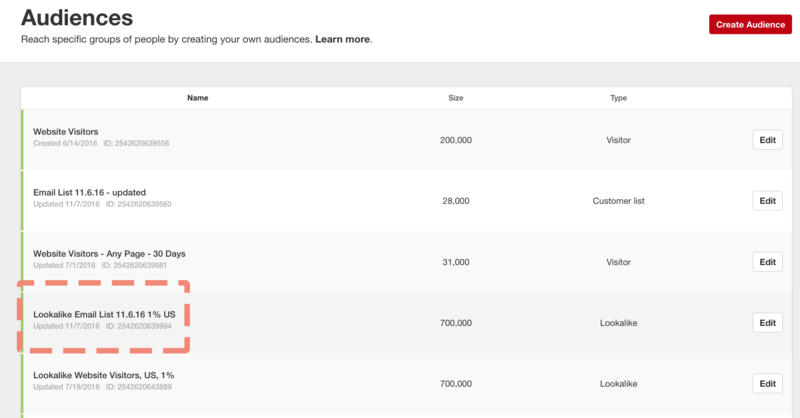 What in the world is Audience A2542520….? Because giving us the audience name would be too easy, Go to Ads > Audiences in the main navigation and match the audience ID to the targeting value. See how the ID matches the “Targeting Value” from our export? So, it looks like our actalike audience (make up your mind, Pinterest – “actalike” or “Lookalike!?!) is performing quite well and at a good price per click. If you had an actalike audience that was 10% instead of 1% (denoting percentage of similarity to your other list), you’d want to see who the more similar pinners were engaging compared to the less similar – and if one was inordinately more expensive than the other. Are there other sections of Promoted Pin Analytics you go to to improve results and lower costs? Let me know in the comments! Was this helpful and/or interesting? Please pin me! 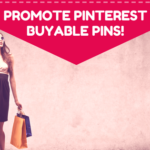 Pinterest Scoop – Promote Buyable Pins!